Today I'm reviewing The Witch's Spellbook - Enchantments, Incantations, and Rituals from Around the World. Starting with the cover of the book, my previous review made it hard for this book to keep up. Both were bound the same. The desperate need for a dust jacket was the only flaw here. The book is hard cover with excellently aligned pages and a fabric feel to the cover. On the first page (which is completely yellow) there is a tiny little voodoo doll icon in the right corner. I love this. It set the mood for the book in my opinion. This little touch let me know this was going to be strictly a spell book. There is a very brief introduction with about six pages on tips, tools and tricks and then BAM! We're into the magic. The spells are broken down by category with all the usual needs. Love. Money. Home and Career. And where would we be without a section on protection, am I right? Each page is a spell. It covers what you need for the spell, when to cast and the history behind the spell origin or source. There are references to Minoan, Roman cultures as well as astrological references and even Hecate makes an appearance. She is called upon by the epithet - Trivia. Draw near, and bestow grace upon my desire." I like this book as it pulls from different paths. Just a short 10 pages later we come upon Norse symbolism in the spell for enhanced Charisma. The author uses Ansuz, Hagalaz, Jera, Dagaz, Mannaz, Wunjo and Inguz to pull together an incantation to sell your ideas, market your wares or increase your charisma. 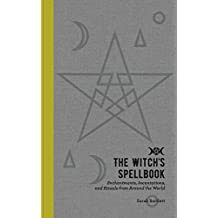 Over all, a really informative book and one that I could see a beginner or maybe even a skilled witch look to for references across alternate paths of study. Special thanks to Fair Winds Press for providing this book for the review.